Recommendation: Although the book traverses between past and present, this is still a good pick since it makes you sit on the edge and feel the journey. 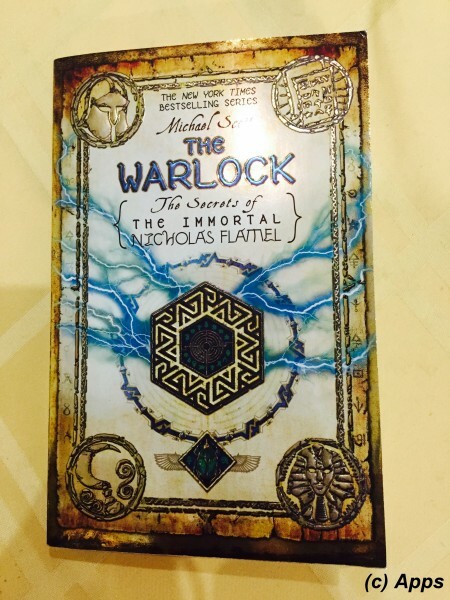 The fifth book in the series titled The Warlock was published in 2011. This book reveals more about Niccolò Machiavelli and why he is The Warlock. Also the plot goes back and forth between present world in San Franciso / Paris and ten thousand years ago in Danu Talis. That back and forth definitely added a lot of confusion for me specially when the same character was portrayed both in present and past. Connecting the dots was a little tough for me, but I still loved the journey because of the myriad of things it fed my imagination. The story picks up with Nicholas "Nick" Flamel weak and unconscious but with Sophie Newman - one of the twins, Perenelle "Perry " Flamel and Niten - a Japanese immortal warrior. Josh Newman - the other twin - still with Dr. John Dee and Virginia Dare. Josh is still under the influence of Dee and is confused as to why his sister has betrayed him, unsure of what truth is and what is lie. Several events happen in this book. In the present - We get to see that Witch of Endor AKA Zephaniah, who had helped Sophie with her powers and grandmother to Scathach, is indeed wife of Mars Ultor - who is currently living under Paris in the Catacombs. She had previously put him under a spell for his own protection. She is also sister of Prometheus (a Greek God who created mankind and gave fire to humans.). She along with two other Egyptian Elders, Isis and Osiris seek out Mars Ultor so they can aid Sophie find Josh. Incidentally the Witch calls him as The Warlock - the one who breaks all rules and acts out of character. Makes one wonder if Niccolo indeed is on the good side of this journey. Prometheus loses his shadow-realm while saving Perry and Nick. They along with Niten and Sophie reach Tsagaglalal - She Who Watches. Sophie finds a surprise here as she is none other than her Aunt Agnes. Tsagaglalal is also married to Abraham the Made who wrote the Codex and was the cause of this entire journey in the first place. More elders join them in this journey to save San Francisco from the wrath of Dee and his vile plans - Odin, a Norse god; Hel, a being presiding over the shadow-realm Hel where she receives a portion of the dead. Niccolo and Bill the Kid make major decisions - which in part makes Niccolo as The Warlock. The hook-handed man is called Marethyu - meaning Death or Man. In the past at Danu Talis - Marethyu brings Scathach, Joan of Arc, Saint Comte de Germaib, Palamades and William Shakespeare to Danu Talis just before its fall, to the strand in time before any of the future strands are formed. Marethyu says, "There are many strands, many possibilities, but we have come back to the point before those strands split apart, where our actions shape the future." But before Marethyu can explain further he gets captured and taken to Aten, ruler of Danu Talis. The rest are put in prison. Abraham the Mage prophesies the end of Danu Talis but works with Prometheus to save the captured prisoners so they can aid in the war. Now this is where the journey gets interesting. Will Dee succeed in his plan? Will Josh reunite with his sister and know the right path? What happens to the captured elders in Danu Talis who traveled with Marethyu? Who is Marethyu in reality and what of his fate when he meets Aten? What happens to Niccolo after his decision? How do the elders in San Francisco who meet at Tsagaglalal (the Twins' Aunt Agnes) plan for the next steps in the impending war that is bound to happen? Will Nick survive the day? What will happen to the present world as well as the Danu Talis? More than ten thousand years ago what plan Abraham had put into motion, will it fall into place as he wanted? Well, that’s a journey you have to travel yourself rather than me narrating. I must say, it was very intriguing, interesting and adventurous.